This Christmas was my first experience with Turkish Airlines. This rapidly expanding air carrier is extending to new destinations in Europe, Asia, Africa and the US. Oslo got its first non-stop connection with Turkish Airlines to Istanbul in 2009. I found that Turkish Airlines offered good value for money. 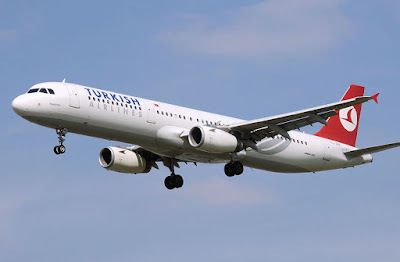 Our flight with Turkish Airlines, goes daily non-stop from Oslo airport to Istanbul Atatürk Airport, leaving Istanbul 12.00 PM EET, arriving Oslo 2.55 PM CET (-1), returning from Oslo 3.50 PM CET landing in Istanbul 8.30 PM EET (+1). Check-in and boarding at Oslo and Istanbul was swift and on time. If boarding with bus at Atatürk Airport, you are advised not to be the first, as you are left to wait in the bus for at leat 15-20 minutes before you are driven out to the airplane. We were more than 30 minutes delayed before take-off due to bad winter weather at destinations in Europe. This was however not due to the airline, but the air-traffic control at Oslo Airport. Very nice and welcoming staff and very good service offered by the Turkish Airline staff. Crew served complementary drinks short time after fasten-seatbelt sign had been switched off. Serving of food followed shortly after. Very good value on complementary goods. Free softdrinks, wine, beer and hard liquor. Free meal on both flights. Choice of different appetizers, two beef, chicken, or fish main meals, dessert, and cheese. Very good and tasty food. A wide range of meals adjusted to religious choice or for allergies available. Enjoy Food & Travel commends the airline on its high quality of complementary goods. Over average comfort. Average seat width. On our way down we were seated by the emergency exit, and offered business class distance to the seat in front. On the way back we experienced its average product. Good seating comfort even in regular seats. Long flying time to destination, due to bad weather and heavy traffic to Atatürk Airport. Force majeure not to be blamed on airline. On return shorter than estimated flight time. Arrival 45 minutes delayed due to force majeure. Arrival 10 minutes before schedule at Oslo Airport December 27th. Flight disembarked swiftly at both airports. No duty-free goods available on flight. Buy your goods at the departing or if possible on arriving airport if flying with Turkish Airlines. NOK 2300 (275 EUR) for the round-trip ticket booked at Turkish Airlines. Very decent price for what was offered. The rating and specifactions you have mentioned for Turkish Airlines seems all good.